I won't say good morning because it really isn't. I feel very sorry for all of those poor people in Japan and in the countries which are being affected by the tsunami. It's dreadful, and I hope that the vast majority of people in the affected areas remain safe. Anyway, changing the subject, I heard on the news earlier that Andrew Stoner has promised to re-evaluate the length of daylight saving after the coalition win the state election later this month. I can't tell you how sick of this discussion I am. It is very tedious having politicians change the length of daylight saving every few years…it seems that just as soon as the states settle on which dates they will all use, one of the states feels compelled to change their start and end dates for daylight saving again. I think daylight saving goes on for a bit too long as it is at the moment, however I also don't like the idea of starting and stopping daylight saving. I think that we should have one timezone and stick to it…in other words, we should either have daylight saving all year round or not have it at all. 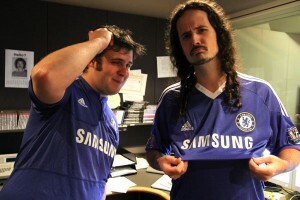 And on the 2UE website there are some photos of the 2UE folk wearing their footy jerseys for Footy Jersey Friday. There's a photo of a "Lawrence" in a Chelsea jersey. I've attached it for your reference…is this the same Lawrence who produces your show from time to time and was recently over in the UK? All the best for the coming day!